Not only did Nigeria deny the brutal murder of Biafrans; they went as far as accusing Amnesty International of witch-hunting them or set up to tarnish their image. Then when Amnesty International uploaded a clip; strong evidence that they gruesomely murdered Nnamdi Kanus’ people who werd praying and singing for the release of their leader, they could not help it as the coldness that went down their spine left them frozen. More denial after that video will not only annoy the world; it would motivate direct action against the State. They went in and thought once more over their mistakes; had they left Nnamdi Kanu and explored other options, life would not have been this regrettable. 87 videos and they still have the audacity to open their mouth to accuse Amnesty; a man the gods want to kill, they first make him mad. It would be fair to conclude that Nigeria is not aware of the path they are on. Nigeria is on her way station to ICC and it would be better they know before the journey is completed. ICC is not a place Tsoho can be ordered to subvert justice or Justice Binta Nyako forced to compromise justice. There will be nobody to be threatened and justice will count; the evidences will speak louder and there would be nothing left but a bar. It takes a Country without focus to begin to fight a world recognized and respected Human Right Institution like Amnesty International, not only is the human right group respectable but also credible. By virtue of history and experience; Amnesty International is a professional institutional that has credibly gone about policing the police and everything that has to do with Human Right question. It also takes a failed State to say that a Human Right group is fighting his Government; one would begin to wonder what concerns Human Right Institution with politics. Had Nnamdi Kanu not been arrested or had the Court been allowed to adjudicate and orders obeyed in response to respecting Nnamdi Kanu’s rights, Amnesty International would not have come in. The denial of the report by Nigerian government tried to tarnish the image of the Human Right Institution and that probably prompted the video upload. With 87 videos, pictures and eye witnesses; denial and then fighting Amnesty do not count in any way or place. It is said that anything that comes in contact with Nigeria gets corrupt and when you fail to get corrupt, you automatically become a threat. The denial by Nigerian government and accusation to discredit Amnesty International is a mistake that have set them on a war path with the Right group. This is likely a show of strength over who wins Nnamdi Kanu- should Amnesty win, it is victory for humanity and Rights and if Nigeria succeeds, then human right is successfully trampled. Nigeria is hell bent on destroying or rather trampling on the human rights of Nnamdi Kanu and his people while Amnesty is hell bent on preserving human rights and Nnamdi Kanu is the epitome of the war or rather the allegory. The war was made visible with Nnamdi Kanu’s matter and while this show of strength endures; it is imperative to draw their various lines of actions. With in-depth reports and awakening of the conscience and consciousness of mankind; Amnesty International will be able to whip up sympathy that will make International Community compel Muhammed Buhari to respect the rights of Biafrans. 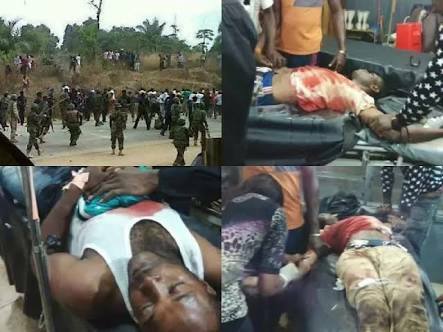 The people of Biafra have succeeded in getting sufficient video evidence of the genocide going on in Biafra land which will prove decisive to the matter. With the case already in ICC; this will give the matter momentum and be an avenue for Amnesty International to thrive. With pressure that will henceforth be coming from that quarter; if Nigeria fails to look into addressing the matter to the expected height, they might be in for another Ivory Coast scene. Though it looks like Nigerian President and some Governors are destined for ICC but a couple of action can preserve them or buy them more time. Hence the major focus of ICC is to bring the perpetrators of this crime against humanity to book; Nigeria can step up independent commission of inquiry to look into the matter which will first start by releasing Nnamdi Kanu and bringing the perpetrators to book. In most cases, Buhari who has continued to show that he ordered the military action can resign and give himself in for trial in Nigeria. Anything short of this move would definitely land him in ICC and then to dine and sleep with Gbagbo. Finally, it is imperative to bring to the knowledge of Nigeria that they cannot win this war; human Right is a thing protected without boundaries and Amnesty International has immense and surplus evidences that can nail them. At the end of the day Nigeria will be destroyed because there are plenty of undeniable evidences starring at the world. There is no way abuse of human Right will continue to linger or win. Amnesty is light that would definitely conquer darkness for wherever light comes, darkness is suppressed.